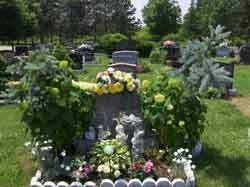 Cemeteries Services administers, maintains and operates municipal cemeteries in the City of Niagara Falls. In an effort to adhere to the highest standards possible, Municipal Cemeteries By-Laws as well as operation guidelines have been developed. 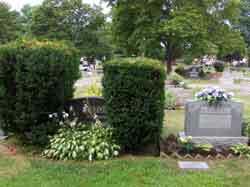 The City of Niagara Falls Cemetery Services has certain restrictions concerning the size of flower beds, acceptable plant material and lot decorations, including the use of borders. Please contact the Staff at the Fairview Cemetery to receive a flower bed brochure and additional information. Before placing a wreath or saddle (monument flower arrangement) on a monument or grave, mark the name of the deceased and the Section/Plot number on the back with a felt marker. If the arrangement goes missing the cemetery staff will be able to identify it and then replace it. Christmas Wreaths may be placed on graves between December 1st and April 1st. Staff will remove the wreaths if left after the month of April. For additional information and the Flower Bed Guidelines and Dimensions brochure, please view the Flowerbed Guidelines. 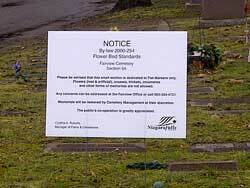 When making arrangements for a burial in a City managed Cemetery, you are not purchasing land in the Cemetery. Instead, you are purchasing the "right to use the lot for burials". These rights are called Interment Rights and you will receive a legal document called a Certificate after purchase. Only the Rights Holder has the right to decide who is to be interred in the plot, as well as purchase a monument or maintain a flower bed. The City of Niagara Falls is responsible for the appearance and maintenance of all municipally owned and managed cemeteries. Cemetery By-laws are in place to assist the City in meeting its responsibilities and providing guidelines to interment rights owners and their families. By-Laws provide standards and restrictions that allow Cemetery Services Staff to provide optimal care in their maintenance and operation procedures with fairness to all families in mind.